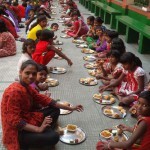 A surprise lunch at POW Kolkata for 150 children topped with mouth watering desserts of chocolate and gift packs. We were joined by a team of about 40 people – an exceptionally special day at POW indeed! Copyright © 2019 Paint Our World. All Rights Reserved.